January 12 is celebrated throughout India, and in countries with large Hindu populations, as the birthday of Swami Vivekananda. A national hero, Vivekananda is revered for updating the wisdom of India’s ancient sages and bringing those teachings to the West, in 1893. By coincidence – or astrological design, take your pick – another vital figure in that East-West transmission was also born on that date, and he too deserves to be celebrated. The man who became known as Maharishi Mahesh Yogi was born Mahesh Prasad Varma, on January 12, 1917, or perhaps 1918, in Central India. While attending Allahabad University, he heard that a famous saint named Swami Brahmananda Saraswati was in the area, and he went to him “as a thirsty man at a well.” Mahesh asked to become the swami’s disciple. The reply was the same one many future gurus received when they were eager young seekers: first finish school. After graduating with a degree in physics, he was formally accepted as a disciple. By then, the swami had been persuaded to accept the much-esteemed, and long-vacant, seat of Shankaracharya of Jyotir Math–one of four monastic lineages established centuries earlier by the great reformer Shankara. The Shankaracharya would become a legend, and so would the humble disciple who served him primarily as a clerk for thirteen years. After his guru died, in 1953, Mahesh spent a few years in the Himalayas before traveling to the sacred sites of South India. In Trivandrum, a stranger asked him to give a public talk. He was evidently good at it. Before long, he found himself on what we now call a speaking tour. At a festival in Kerala in 1955, people were impressed enough to call him a “Maharishi”–maha meaning great, rishi meaning sage–and the appellation stuck. When he became world famous a dozen years later, the naïve press treated “Maharishi” as his name, and that’s what he’s been called ever since. That global fame, as most people know, resulted from his historic encounter with the biggest celebrities of the postwar era. In August, 1967, at the suggestion of George Harrison’s then-wife Patti, the Beatles went to hear Maharishi speak about his Transcendental Meditation at the London Hilton. They became instant enthusiasts and, six months later, went to India for an extended stay at Maharishi’s ashram. In the opening paragraph of American Veda, I refer to that as “the most momentous spiritual retreat since Jesus spent those forty days in the wilderness.” It was as if the earth itself had tilted, allowing the insights of India’s yogis to pour into the West at an accelerated pace. It was easy at the time for reporters to write off “the Beatles’ guru” as a lucky guy who got rich and famous off the lads’ monumental celebrity. It was easy to label him “the giggling guru” because he had an infectious, high-pitched laugh and he found much of modern life rather amusing. It was easy to mock him as the face of guruhood at a time when yoga and meditation were seen as accessories of flower-power counterculture. All of which belies the fact that Maharishi was a very practical man who took his mission–to spiritually regenerate the world by expanding individual consciousness–very seriously, and he worked longer hours in its service than most CEOs could endure. He had been planting seeds non-stop for a dozen years when the Beatles sought him out, repeatedly circling the globe and teaching his simple, powerful form of meditation to all comers, and he kept at it for another forty years after the Fab Four made Rishikesh a pilgrimage site for Western yogis. If history is fair, he will be recognized as one of the key figures in the transmission, adaptation and assimilation of Yogic teachings into the mainstream of American life. Nowadays, everyone from ordinary physicians to giant HMOs recommends meditation to reduce stress and prevent illness. This, to put it mildly, was not the case in 1968. It was Maharishi who convinced scientists to study the practice, and he made sure his systematic TM procedures were compatible with research protocols. He understood that ours is an evidence-driven age, and that Americans would embrace something as exotic as meditation only if science demonstrated its value. The first paper on the physiology of meditation was published in 1970, by one of Maharishi’s students, a UCLA doctoral candidate named Robert Keith Wallace. The collective research juggernaut that followed ushered meditation from the fringes of society to the center, and directly into your armchair, cushion or yoga mat. So, for whatever stars and planets were aligned on those two January 12s, we can be doubly thankful. See this related article by Phil on THEWORLDPOST: Beatles in India: The Retreat That Reverberates Across the Universe. My personal note: Reader responses to the article are also worth reading. Click on the Title, then scroll down to the Conversations section after the article. It may take a while to load as it’s the original URL located by the WayBackMachine. I enjoyed them all, but found Lawson English’s comments especially enlightening, detailing all the things Maharishi did as Guru Dev’s disciple at the ashram, and what his successor had said about Maharishi. Related: Watch the 1968 film of Maharishi at Lake Louise | Maharishi Mahesh Yogi on History International Channel (November 2007)|Cheryl Fusco Johnson interviews Philip Goldberg, author of American Veda: How Indian Spirituality Changed the West|George Harrison: The not-so-quiet Beatle, article by Philip Goldberg in LA YOGA Magazine|Huffington Post: Transcendental Meditation: Topping The Bestseller List Since 1975|‘Vedanta and yoga perfect match for certain American values’|Who was Dear Prudence the Beatles sang to in India? What happened to her? Here is her story. Enjoy this video portrait of Prudence Farrow Bruns, the inspiration for the Beatles song “Dear Prudence”. Prudence discusses her personal journey, meditating with the Beatles in India, the transformation her generation tried to bring about in the world, and the change that can only come from within through Transcendental Meditation. Directed, shot and edited by Kryshan Randel, music by Mike Pellarin, produced by David Shaw for iTranscend TM, a concept created by Ashley Cooper. 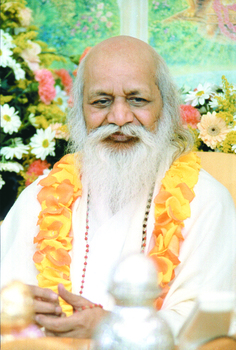 For more information on Transcendental Meditation, visit these websites: http://maharishi.ca (Canada) and http://www.tm.org (USA). Visit the newly launched Dear Prudence Foundation and click on About Prudence to read about her journey and why she set up a foundation: http://dearprudencefoundation.org. See these other interviews with Prudence: 1) Amitava Sanyal, Allahabad, for BBC News India: Prudence Farrow — subject of the Beatles song Dear Prudence — visits India’s Kumbh Mela, and two videos: 2) Ted Henry interviews “Dear Prudence” Farrow Bruns about her life with TM and Maharishi, and 3) MicCameraAction: PRUDENCE FARROW BRUNS. Another video portrait made by Canadian filmmaker Kryshan Randel is about Paralympian Daniel Westley. Westley had represented Canada in the 1988 Paralympic Games in Seoul, South Korea. As Paralympic Games grew, Daniel went on to participate in both the summer and winter games in a wide range of sports that included everything from wheelchair racing to skiing. Read this inspiring story: Meditation key to finding balance for Paralympian Daniel Westley — special to The Vancouver Sun, which contains the video, Physical Meditation: A Portrait Of Daniel Westley. Both videos appear on the iTranscend TM YouTube channel series along with other heartfelt testimonials from new meditators, meditators dicussing meditation, and portraits of veteran meditators — people from all walks of life telling their stories — a physiotherapist, bakery story owner, musician, students, sharing how they are realizing their potential through the profound life-changing benefits of their Transcendental Meditation practice. And this video is an edited composite of some celebrities talking about the value of meditation, TM, in their lives: iTranscend Hollywood. See: Who was Dear Prudence the Beatles sang to in India? What happened to her? Here is her story. Prudence’s memoir is now out: Dear Prudence: The Story Behind the Song. Read this excellent article in the Pensacola News Journal: Woman behind Beatles ‘Dear Prudence’ reads at Open Books. The subject of a Beatles song is among the many foreign pilgrims visiting India’s Kumbh Mela festival. Prudence Farrow, about whom John Lennon wrote the song Dear Prudence, is also sister of Hollywood actor Mia Farrow. The Kumbh Mela, which is held every 12 years, is billed as the world’s biggest gathering of humanity. Millions of Hindu ascetics and pilgrims take a dip at Sangam, the confluence of the Ganges and Yamuna rivers in Allahabad city. Ms Farrow says she waited for four decades to come to the Kumbh Mela. She had first visited India in 1968 as a student of meditation and met the Beatles at Indian guru Maharishi Mahesh Yogi’s retreat in Rishikesh. “I wanted to come to the Kumbh with the Maharishi, but that never happened,” she told the BBC. Her guru died in 2008. 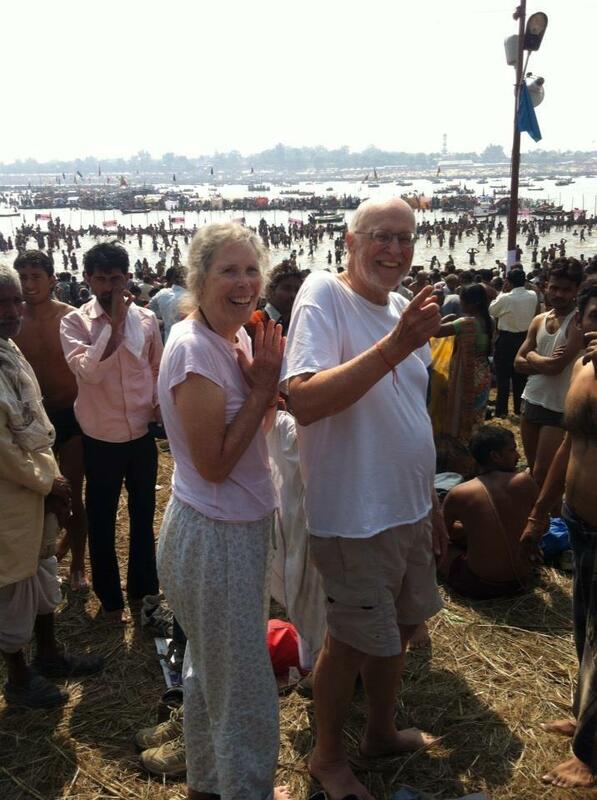 This year Ms Farrow finally made it to the Kumbh Mela with her husband Albert Bruns. 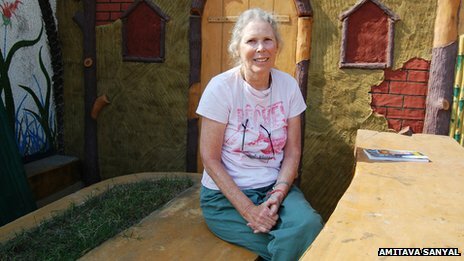 “India has changed so much since I first came here,” says Ms Farrow, 65, sitting in the brightly-painted porch of her rented flat in Allahabad. “Back then it was exotic. We were staying in the forest outside Rishikesh. Life was quite agricultural even in the cities. Ms Farrow says she was in for a shock when she first arrived at the festival ground last month. At first, she insisted on staying in one of the tens of thousands of tents that have been put up on the banks of the river. Ms Farrow, who has a doctoral degree in South Asian studies and runs foundations to promote meditation, says she was in search of “an inner silence”. But, ironically, the blare of three loudspeakers every morning at the festival grounds shattered her peace and she shifted into the city. This was, she says, in sharp contrast to the peaceful times she spent with her sister Mia at her guru’s retreat in Rishikesh in 1968. At the retreat, the Farrow sisters met the Beatles. “Because of Mia there were too many people coming in and out of our block,” says Ms Farrow. “And then in the evenings George Harrison would jam with John Lennon and others would join in. I wasn’t getting the silence. So while the rest of the students partied, Ms Farrow says she locked herself up in her room and practised meditation. That is when, she says, Lennon, wrote the song Dear Prudence, which appears on the band’s White Album. The song’s hand-written lyrics, lined with doodles, sold at a Sotheby’s auction in 1987 for $19,500 (£12,800). “The reason he wrote I was beautiful – and there were much more beautiful people around – was because I was so much like George,” says Ms Farrow. Ms Farrow says she did not want to meet the Beatles as “great people never lived up to their image”. “What didn’t disappoint me was that they were still real people. They weren’t more important than anybody else,” says Ms Farrow. “Fame has that quality – it corrupts you. You begin to feel that you’re separate from other people, you’re more powerful. But they didn’t have that. Here is a related post: Varanasi by Mary Oliver in A Thousand Mornings. See Ted Henry interviews “Dear Prudence” Farrow Bruns about her life with TM and Maharishi, and an interview with PRUDENCE FARROW BRUNS by MicCameraAction after her return from the Kumbh Mela. She talks about her time with Maharishi and the Beatles in India and her new Dear Prudence Foundation to make Transcendental Meditation available to those who want it but need a scholarship to help pay for it. And this video: The Beatles “Dear Prudence”: A Portrait of Prudence Farrow Bruns, Maharishi and TM. This is a funny video of Prudence’s sister, Mia Farrow: Dear Prudence. Here’s a photo of Prudence and Albert getting ready to bathe in the Ganges at the Kumbh Mela. I’ve never seen them looking so happy! For those of you who missed the A&E biopic on Maharishi Mahesh Yogi, aired on their History International Channel, November 28, 2007, it has been posted in its entirety on blip.tv by Raja Felix http://rajafelix.blip.tv: GOOD NEWS – Indications of rising global consciousness. This episode’s permalink: Maharishi on History Channel. A French translation in 5 parts is available on YouTube: Maharishi Mahesh Yogi – Documentaire – 1/5, 2/5, 3/5, 4/5, 5/5. ITN Factual, a production company based in London, UK, was commissioned by A&E, Arts and Entertainment channels, to do a film biography on Maharishi Mahesh Yogi. Producer/Director Fiona Procter came to Fairfield, Iowa in October 2007 and the show was aired on the History International Channel on Nov 28, 2007. Interviews included Drs. Bevan Morris and John Hagelin, David Lynch, Donovan, Mike Love, Teresa Olson, Jerry Jarvis, Alan Waite, Deepak Chopra, and others, with footage of students meditating at Maharishi School, Yogic Flying at Maharishi University, and visuals of the Tower of Invincibility, the Golden Dome, MUM Campus, and Maharishi Vedic City. There was historical footage of the Beatles. Segments from Alan Waite’s documentary on Maharishi, Sage for a new Generation, were amply used, and precious early personal footage from Eileen Learoyd’s private collection in Canada were found and portions sent to the producer, which appeared throughout the film. Enjoy! About seven years later Raja Felix Kaegi posted the film on YouTube, which is how we can now play it here. Also Watch the 1968 film of Maharishi at Lake Louise. See New film shows David Lynch retracing Maharishi’s footsteps from North to South India and the start of the TM movement. For more information on Maharishi’s Transcendental Meditation Program here is a list of some country websites: United States: http://www.tm.org | Canada: http://www.maharishi.ca | Latin America: http://www.meditacion.org | Brazil: http://www.meditacaotranscendental.com.br | England: http://www.t-m.org.uk | France: http://www.mt-maharishi.com | Germany: http://www.meditation.de | Australia: http://meditationsydney.org.au | New Zealand: http://www.tm.org.nz | Africa: http://www.tm-africa.org | South Africa: http://tm.org.za | India: http://www.maharishi-india.org/programmes/p1tm.html | Japan: http://www.maharishi.co.jp | China: http://www.tmchina.org. Find out where you can learn Transcendental Meditation in other parts of the world: http://intl.tm.org/choose-your-country. Here are links to two articles on the TM.org Blog with videos of David Lynch interviewing Paul McCartney about his experiences with Maharishi Mahesh Yogi and Transcendental Meditation. This was recorded by David Lynch Foundation Television during the rehearsal for the Change Begins Within Benefit Concert to teach 1 million at-risk students to meditate. Many celebrities performed on that April 4, 2009 concert. It will be broadcast on PBS starting April 29, 2012, 3 years later, on New York’s channel THIRTEEN. Here is Heather Harnett’s opening, written a year after the concert, which will now be broadcast on PBS three years later, two years after Heather’s writing about it, all in the month of April. Before the concert, before the hubbub and the crazy excitement and the buzz, before it all, David Lynch sat down, individually, with Paul and with Ringo for a quiet talk on camera. They candidly discussed their 40-plus year Transcendental Meditation practice, their meetings with Maharishi Mahesh Yogi, and how Maharishi and meditation have influenced their lives. It was the first time in decades that Paul and Ringo had spoken of those days that historians have said helped to transform the music, the culture, and the future of the world. Click here to read the rest of the article: David Lynch Interviews Paul McCartney About Transcendental Meditation (Part 1) and watch Part 1 of the interview followed by Part 2, where Paul McCartney remembers his first meditation with Maharishi. See Ringo Starr Interview from the Change Begins Within Benefit Concert and The former Beatles Paul McCartney and Ringo Starr reunion for David Lynch’s benefit concert airs on New York’s THIRTEEN, Sunday, April 29. James McCartney, son of former Beatle Paul McCartney, will play his American debut concert Nov. 14 at Maharishi University in Fairfield, Iowa. The younger McCartney will perform during the fourth annual David Lynch “Change Begins Within” Weekend, Nov. 13 to 16. Also performing will be Donovan, who joined the Beatles in Rishikesh. Blueser Laura Dawn and her group The Little Death will fill out the bill. The concert comes a little more than 40 years after James’ father, Paul McCartney, traveled to Rishikesh, India, to study Transcendental Meditation with Maharishi Mahesh Yogi. “James has a way with melody and a set of pipes, which are more than a match for his dad’s,” a recent article in the UK Sun declared. In a statement issued for the concert, he said this is something he’s been working towards for a while. McCartney says his father played a big role in helping him develop his musical talent. “My dad taught me guitar when I was nine. I play a Fender Stratocaster, which Carl Perkins gave me from the seventies, and a Gibson Les Paul that my dad gave me — heart red. The group is touring and also in the midst of recording an album. “We are mixing our album in Hog Hill Studio, Sussex. The words on the album refer to spirituality, love, family, trying to sort out one’s own life, and many other things. I have written the songs over a ten-year period,” he says.